A Denver school teaches people to analyze cannabis samples like a sommelier. Montrose’s quest involves locating proper samples of cannabis to teach the students in his class how to detect specific characteristics of the cannabis flower. He’s been providing cannabis education classes in Colorado for more than eight years. In addition to being the Trichome Institute’s president and co-founder, Montrose has authored several textbooks on cannabis sales training and products, and written for many cannabis-related magazines. He’s also developed his own tools, such as the “Interpening Loop,” to help users determine the effect a cannabis sample might have. The class Montrose is shopping for on this outing will be a combination of Trichome's Level 1 and Level 2 “Interpening” course. The class starts with a three-hour lecture, where Montrose discusses several topics including the history of cannabis, the anatomy of the plant and how to tell good quality from bad. Following the lecture is an olfactory workshop, where students have the opportunity to get hands-on with the plant. There they learn how to use their senses to determine good and bad cannabis samples, and how to figure out where on the spectrum of psychoactive activity a cannabis sample falls. Terpenes are chemical chains that, among other things, give a plant its fragrance. Moreover, it’s widely held that terpenes have a pharmacology, meaning they have certain properties or reactions which can have a therapeutic value. There are three levels of certification for Interpening at the Trichome Institute. For Level 1, the class costs $165 when taken in Denver, and consists of a 3-hour lecture on cannabis basics, the strain name dilemma, trichomes (outgrowths or appendages on plants), strain structures, quality analysis and the methodology behind Interpening. Montrose says the class can sometimes be taught outside the state of Colorado because it doesn’t involve any cannabis samples. Level 2 classes, which Montrose says usually have about 30 students and account for about 95 percent of the Trichome Institute’s Interpening Colorado classes, cost $249 when taken in Denver. The Level 2 classes include the Level 1 lecture, plus an additional olfactory workshop with samples of cannabis. It wraps with a certification test on the skills and information taught in the class. The highest level of Interpening certification -- Level 3 -- is by invitation only. “Level 3 gets more microscopic, hashes and concentrates, horticulture, history and more,” said Montrose. During the first stop on today's mission, Montrose interpened more than a dozen cannabis samples, and left with several teaching examples for his upcoming class. While shopping for samples, Montrose says that often it can be difficult to tell the budtender that he’s not looking for what the typical cannabis consumer might be seeking. While on his bud quests, he’s “needing to really… focus on the jar and see it and really smell it [and] determine if this is a proper sample for class or not,” he says. 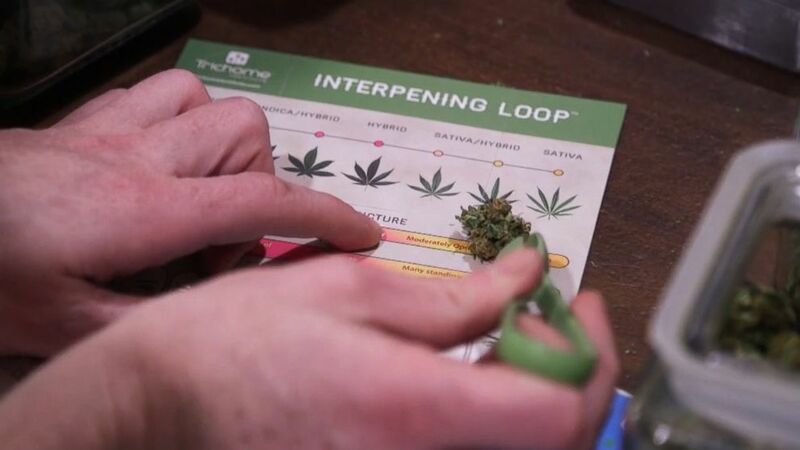 (Jason Kurtis/ABC News) A cannabis sample is compared to the Trichome Institute's Interpening Loop. Montrose points to several studies that found each cannabis sample contains over 200 terpenes. According to Montrose, by identifying the dominant type of terpene on a cannabis sample and where that smell is being felt in the nose, a user can determine what sort of impact a particular cannabis sample might have on a person when smoked. Dr. Donald Land, chief scientific consultant for Steep Hill Labs, Inc. in Berkeley, California, told ABC News that while the Interpening method isn’t a substitute for scientific laboratory testing, it’s certainly better than nothing. Land cautions that the only true way to know what terpenes are on a cannabis sample is to perform scientific testing. A specific terpene scent may not represent all of the undetectable terpenes on a sample, Land says. He adds that without validation of the Interpening process in a laboratory, there is no way to know if the results are correct. Steep Hill’s lab is an independently owned and operated analysis, biotechnology, and research and development facility that seeks to “empower cultivators, dispensaries, manufacturers, and consumers with a transparent understanding of science,” according to its website. Land is also a tenured chemistry professor at UC Davis and co-founder of Halent Laboratory, which later merged with Steep Hill. Land says that there are some contaminants that may be found on a cannabis sample that cannot be seen by the naked eye. Just as with terpene analysis, he says, the only true way to analyze a sample is with proper lab testing. Montrose, however, reminds his students in every class he teaches that Interpening is his own theory. He’s claiming that terpene laboratory tests will not tell you the psychotropic value of a cannabis sample, but the theory of Interpening will. And Montrose readily admits that Interpening does not replace standard lab testing. But he says he’s currently in talks with scientists who have attended his class and saw the value in the Interpening theory. The scientists have begun to negotiate investing in the system, as well as working on developing mechanized systems that can implement Interpening techniques. Montrose and his partner Jim Nathanson founded the Trichome Institute in 2014. Nathanson is the institute’s CEO. “The Trichome Institute is really just a mission to end cannabis misinformation by educating people on cannabis things that we know to be real and true,” Montrose said. The institute is an approved Colorado Marijuana Enforcement Division (MED) Responsible Vendor Program Provider. The content of its curriculum has been approved and found to meet the requirement of MED regulations by MED and the Colorado Department of Public Health and Environment, a spokesperson for the Colorado Department of Revenue confirmed to ABC News. Now is a great time for marijuana education in the Centennial State, as business is growing. According to data from the Colorado Department of Revenue, more than $19.6 million was remitted to the state last June for all marijuana taxes, licenses and fees -- a 7 percent increase from the same month in 2016. For the first six months of 2017, the total was more than $94.8 million. 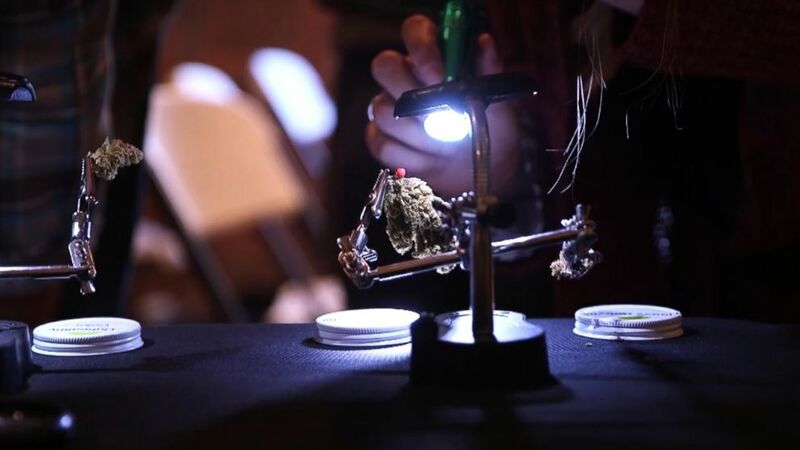 (Jason Kurtis/ABC News) A student enrolled in an interpening class inspects a cannabis sample in Denver, Colorado. Activists, writers, growers, budtenders, lawyers and product specialists have all attended the class, Montrose says. “What’s really cool about Interpening is there’s not one particular type or group of person who comes more often than other groups...it’s really a mixed group of people,” he added. Colin Fletcher, a Denver-based attorney specializing in marijuana law, has an Interpening Level 2 certification. “I utilize the knowledge I learned in the course primarily with product specifications," he told ABC News. Allie Greenstone, who is Montrose’s girlfriend, also has an Interpening Level 2 certification. As a sales rep for Mary’s Medicinals, her job centers mainly around education and training dispensary staff and patients on the company’s products -- including cannabis-infused transdermal patches, gel pens, topicals and other non-psychoactive products. “The reason I was so excited about it was to be able to learn more about actually looking at the plant, and being able to ignore something so ambiguous as a strain name or even THC content. I feel so many people go into dispensaries just looking, 'Oh, this one has 26 percent THC, this one has 15 percent THC, so I’m going to go for this one,' when in actuality, that really plays very little factor,” Greenstone said. On that winter day, Montrose ended his “weed-hunting mission” with more than a dozen suitable fresh cannabis samples in hand. He’ll add this fresh crop to his existing stockpile of samples -- both good and bad -- for his students to learn from. In the future, Montrose hopes that the Trichome Institute will be able to harvest their own flower so that they can have better control over the variety types and freshness of the samples.